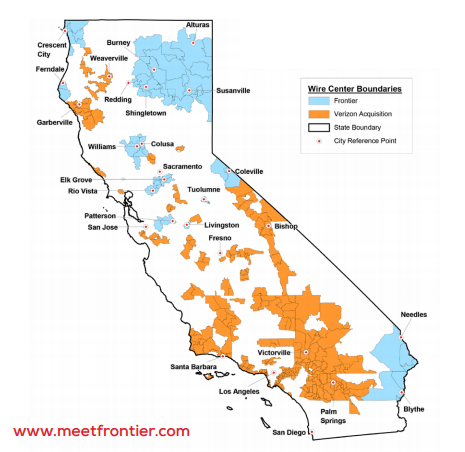 Well I have seen bad companies before but I have never seen anything like Frontier Communications. First of all I had Verizon Communications for several months and had several problems with them all based on billing issues. So not a big fan of Verizon Communications but at least I got the issues resolved just to be repeated the following month but again, I got it resolved. Two days ago I get a bill from Frontier Communications stating that they took over Verizon Communications. And of course my bill was wrong and I was overcharged. I called their 800 number and of course since I live in the USA and get to talk to someone in another country (Philippines) that could not speak english and was hung up on twice. The next day I talked to someone at Frontier Communications in the United States and got hung up on another two times. One pretended to be a supervisor. I called back and got someone else who told me the deal I had with Verizon Communications is no longer valid and my price for service went up. It doubled by the way! I could not resolve my issue with this garbage company and braindead employees so I cancelled my service. I was lucky I did not have a contract, others were not so lucky. My advice is to avoid Frontier Communications and hopefully a nice class action lawsuit will shut them down. Worst customer service I have ever experienced in my lifetime. In my opinion, Just a poorly run dumb company with zero integrity. As of late Monday afternoon, Downdetector.com still shows widespread outages for Frontier customers in North Texas, western Florida and parts of California. 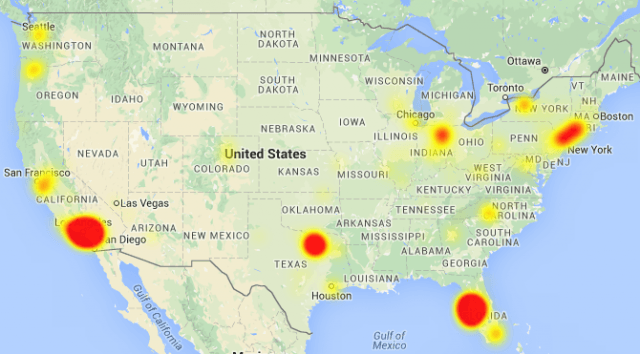 Despite promises this past weekend’s transition from Verizon Communications to Frontier Communications would result in little more than “a logo change,” countless customers in the affected states of Florida, Texas, and California reported long service outages, website problems, and long holds waiting to talk to customer service representatives about when service would be back. Louise Thompson called the transition “a total fiasco” and some businesses lost thousands of dollars on Friday alone. The “Happy Grasshopper” was one of them, after losing Internet and phone service. “We have 20 employees who can’t get any work done here today,” said owner Dan Stewart. The City of Plano (Tex.) lost its website in the transition. 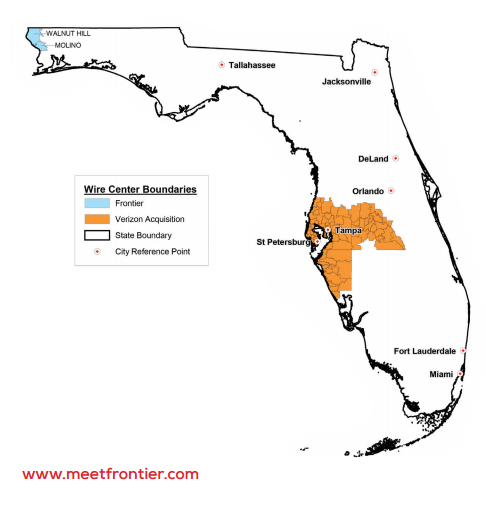 Frontier shared its failure with AT&T mobile customers in parts of Florida, who found cell service not working because Frontier also took control of fiber links connecting many of AT&T’s cell towers to AT&T’s network. Many of those were down too. Across all three states, Frontier officials hurried to downplay the impact of the service outages, which are continuing to this day for some customers. 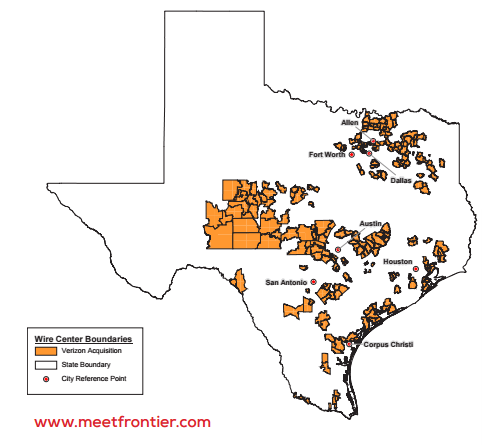 In some statements, Frontier claimed only about 500 business customers lost service, and there were no widespread problems. But many of the 3.7 million customers in Texas, Florida and California enduring the transition say those outages and problems affect residential accounts. 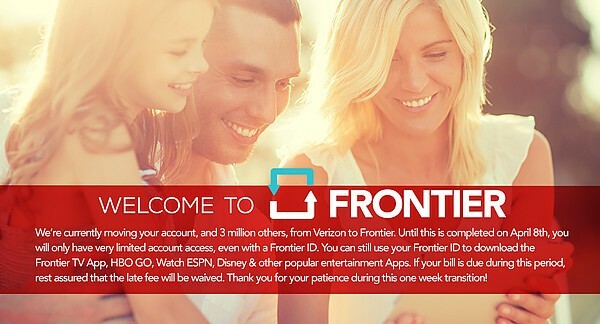 One of the biggest problems customers are encountering is the procedure to transition their online access from Verizon to Frontier. To begin that process, customers need a new Frontier ID, but that is easier said than done if you lack landline service. As part of the registration process, customers need to enter the account PIN number usually displayed on landline bills, but often missing from broadband-only service bills. Lee Allen of Dallas was one of many frustrated customers. He spent an hour trying to manage the Frontier MyAccount registration process and when he tried to sync his Verizon and Frontier account together, it was a flop. Two calls to Frontier customer service and still no joy reports the Dallas Morning News. Frontier says they are aware of this problem and are working on a solution. Los Gatos customers were assured the transition on April 1 would be smooth with no interruption to service. But that hasn’t been the case, said Beau Graeber, Fenesy’s neighbor who’s helping him contact the company and reconfigure his Internet. The Nickelodeon Jr. FiOS TV Widget/App was retired by Nickelodeon on March 31 prior to the transition to Frontier. It is, therefore, not available. Customers can still watch Nick Jr. on their home television. Customers can also access Nick Jr.’s programming via the web, at www.nickjr.com, or through Nickelodeon’s mobile apps for iOS and Android. When searching for a Video on Demand title with the FiOS TV remote, customers may notice due to the transition from Verizon to Frontier, many of the movies and TV shows are not appearing in either “New Releases” or “Collections”. However, they can be found by scrolling down to “By Title” and then selecting “All” in order to find your choice. You can also search for your VOD by selecting the “B” button on your FiOS TV remote. Frontier promised regulators things would go better for new Frontier customers after the company botched a similar transfer of AT&T customers in Connecticut that went so poorly, the company had to offer $50 service credits to affected customers. “We have lessons to learn,” Frontier spokeswoman Kathleen Abernathy told Connecticut regulators at the time.